I made my dough and baked the biscuits the night before I built the house to make sure they were fully cooled and to split the process up a bit. Prepare a side wall template that measures 12.5cm x 20cm. You will need to cut two of these out of the gingerbread. Prepare a gable end template that measures 12.5cm x 12.5cm with a triangle on the top of the square that has 8cm sides and a 5cm pitch. You will also need two of these. Prepare a roof template that measures 9.5cm x 22cm. Add a 3cm x 3cm square on one of the long sides of the roof. You will need two of these. Don’t forget to flip this template for the second roof half so that the 3cm square holes line up for the chimney. Make a 3cm x 5cm rectangle for the chimney. You will need to cut out four of these. In two of them, cut out a small but wide triangle (mine wasn’t wide enough) on the bottom so it fits on the roof. 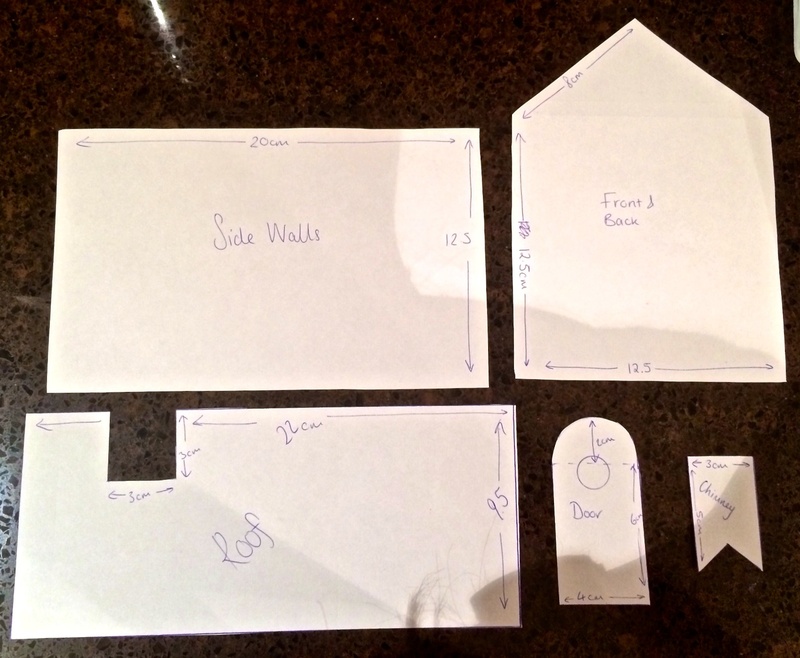 You can make a door template by measuring a 6cm x 4cm rectangle and giving it a rounded top. 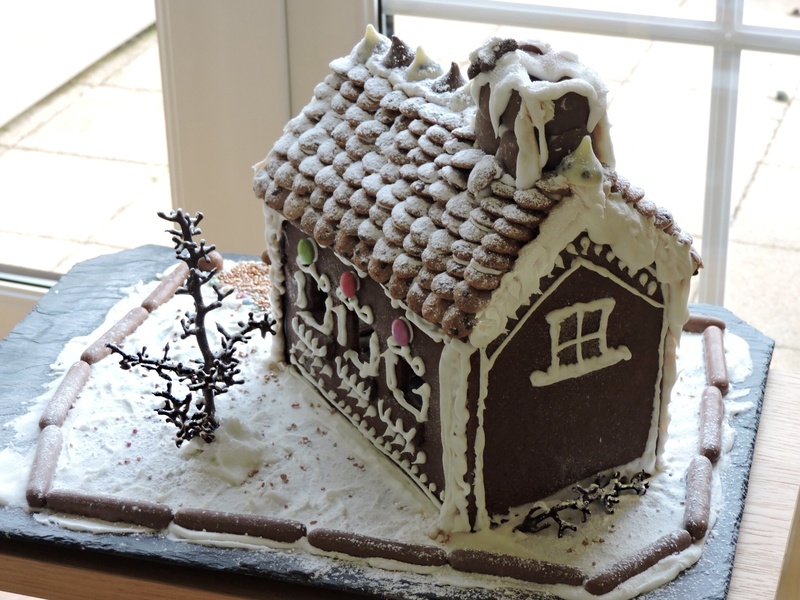 (I made the template but forgot to cut it out of one of the gable ends before baking so i just cut it straight out out of the gingerbread as soon as it came out of the oven, but you can bake it separately if you like). 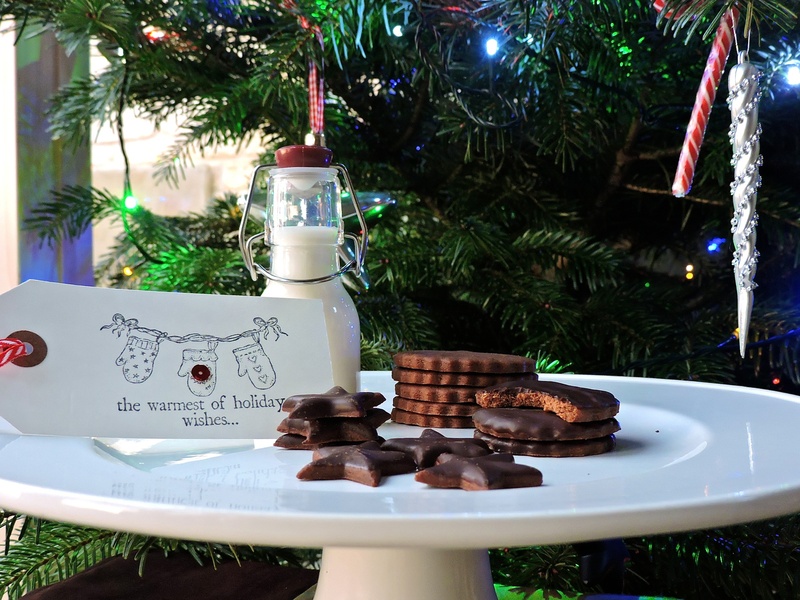 Now you have the templates, you can make the gingerbread. All you need to do is put the butter, brown sugar and golden syrup (don’t be alarmed at how much golden syrup there is) in to a mixer and beat until paler in colour and fluffy. Add the egg yolks and mix until just incorporated. 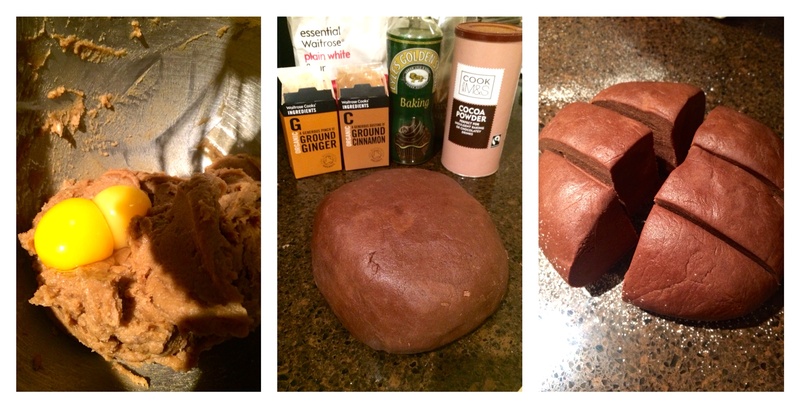 In a separate bowl measure out the plain flour, cocoa, ground ginger and ground cinnamon. Mix it lightly to combine and begin adding it spoonful by spoonful to your buttery mixture. The dough comes together pretty quickly but you might need to use your hands to bring the final bits together. Once combined, roll on to a floured surface and knead lightly until the dough is smooth. Preheat your oven to 180°C FAN and line three baking trays, or however many you have. Put the dough in cling film and chill in the fridge for 30 minutes minimum. Take your cooled dough out of the fridge and cut it in to six equal portions. Roll the first portion out to about the thickness of a pound coin and carefully cut around your side wall template. Repeat this with another dough portion for the second side wall. Cut out small squares for windows using your knife. Place the side walls on a baking tray and bake for 15-20 minutes until golden. Make sure you slightly over bake the gingerbread as if it’s soft and chewy it won’t hold up. Use the remaining dough portions to cut out the rest of the house parts using your templates. Make sure the dough is evenly rolled each time so they all turn out the same thickness. Bake for 15-20 minutes each time and let the parts cool on a wire rack. Once the shapes come out of the oven, trim the sides down ever so slightly so you have flat, even edges. There should be plenty of dough leftover for you to make biscuits. I’ll include guidance on the biscuits at the bottom of this post. Make the royal icing for decorating. You will need to add the egg whites to a stand mixer and beat until frothy and in soft peaks. Then add the icing sugar and lemon juice. The consistency of royal icing is similar to toothpaste. Be intuitive with this, if it looks like it needs more icing sugar then add some more. If it needs thinning then add more egg white. It needs to be piped on so you don’t want it to be too stiff. The egg white in royal icing makes it set hard so you need to add this. Next, you need to decorate the walls and roof. I piped royal icing in simple patterns on all of the walls and dusted with edible glitter, adding smarties. For the roof panels, I used royal icing to stick cookie crisp cereal down in a roof tile pattern. You could also use chocolate buttons but I liked the cottage feel from the cookie crisp. Let everything set and harden slightly before you assemble the house. 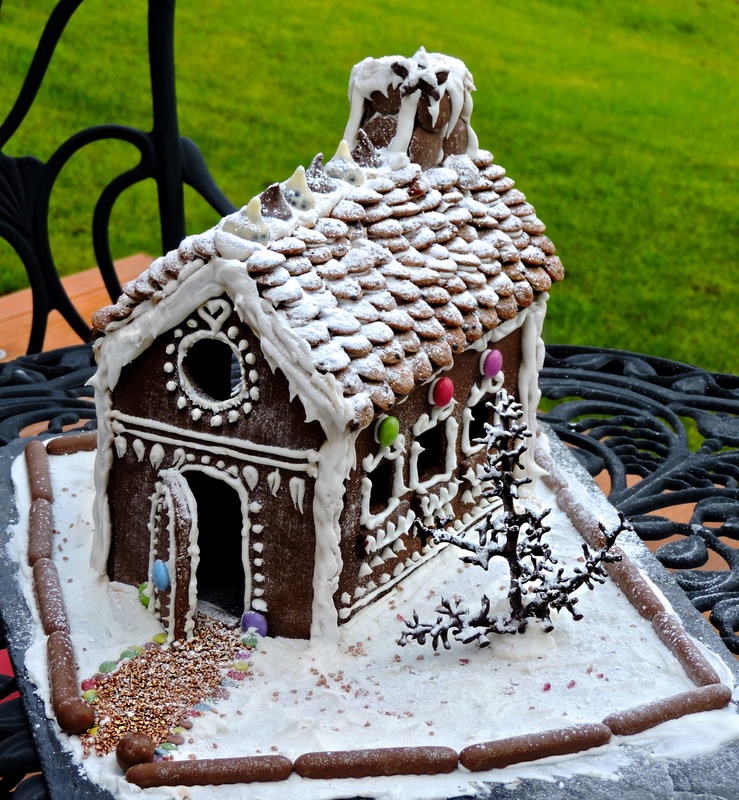 To assemble the house, you need both royal icing and caramel. I used caramel to stick the house together because royal icing takes forever to dry and isn’t as sturdy as caramel. 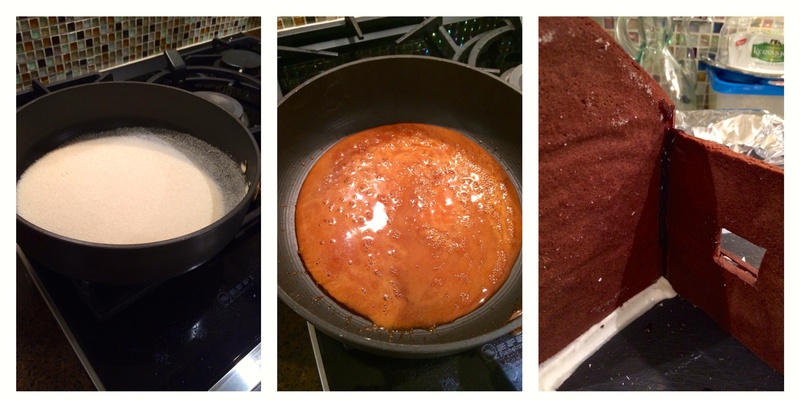 Heat the sugar in a pan until golden and completely melted. You need to dip each side of the wall in caramel to make them stick together. Be VERY careful here and wear kitchen gloves or disposable gloves if you have them. The sugar will burn you if you get it on your skin. Once the caramel has hardened, you can go round the joins with royal icing to make it look like a traditional gingerbread house and cover up the dark caramel colour. Now you can decorate the board or plate with royal icing and add walls or a gate and path leading to your house. The decoration is completely personal and subjective so do as much or as little as you like. 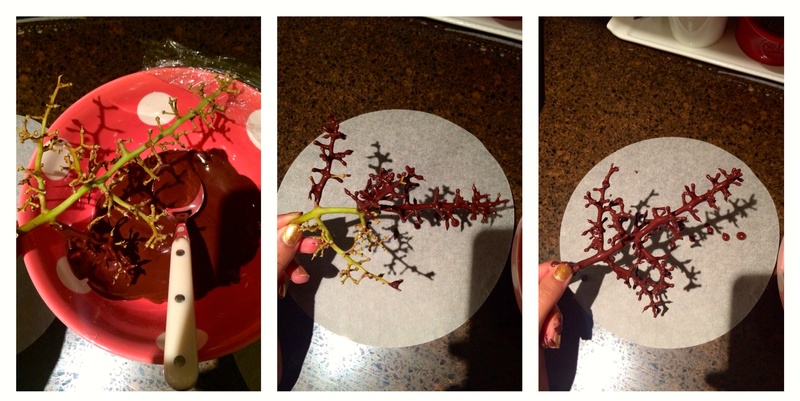 I made chocolate trees to go on my gingerbread scene out of grape stems. All you need to do is take the grapes off their stems and coat the stems in melted dark chocolate. Let them harden and set before you use them. Stick them down to your board with fondant and royal icing. Or improvise and use a marshmallow or something to hold it down on the board. 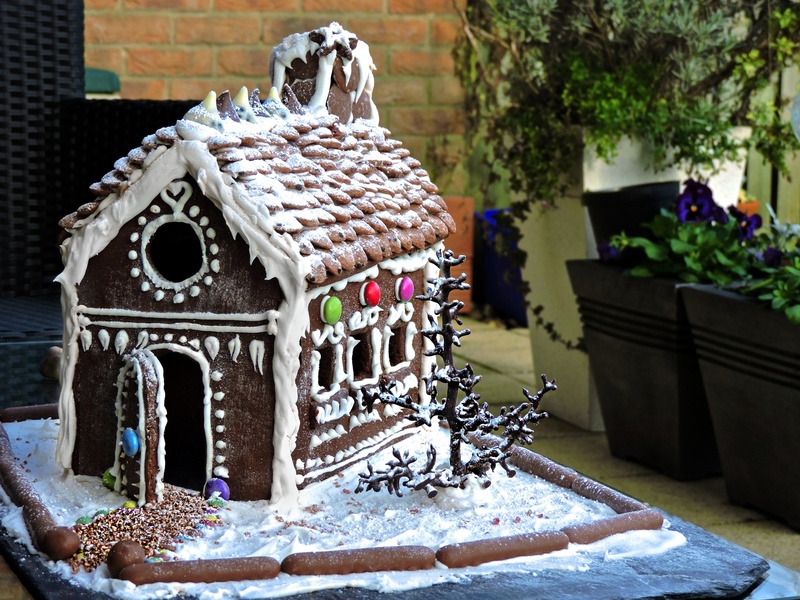 Dust the whole thing generously with lots of icing sugar and edible glitter to look like a snowy wintery scene. Oh, and the whole thing smells AMAZING. Like a bakery/chocolate factory. Unreal. For the biscuits, roll the remaining dough slightly thinner and cut out shapes. 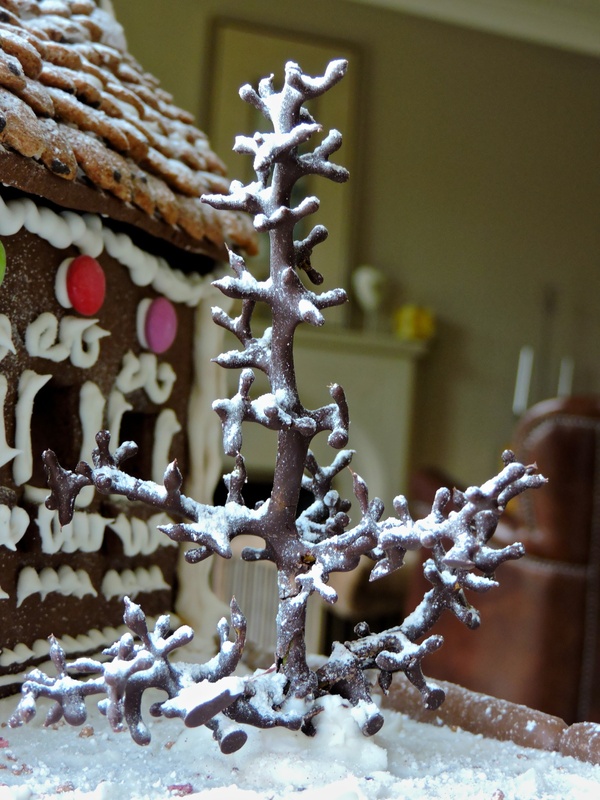 If you want to add holes so you can put them on the tree then add them now using a small icing nozzle. Bake the biscuits at 180°C for 6-8 minutes. 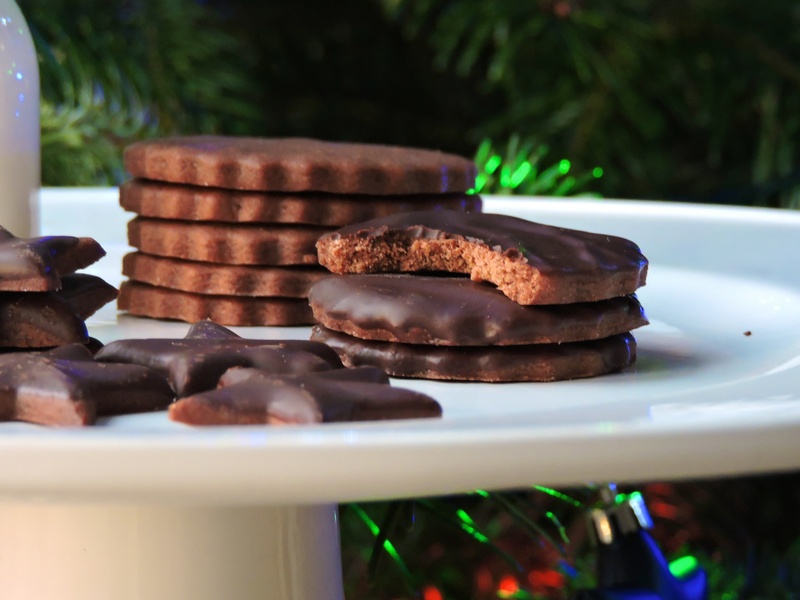 Leave to cool on a wire rack and the biscuits will be much softer and chewier than the ones used for the house. Cover in dark chocolate, if you like. 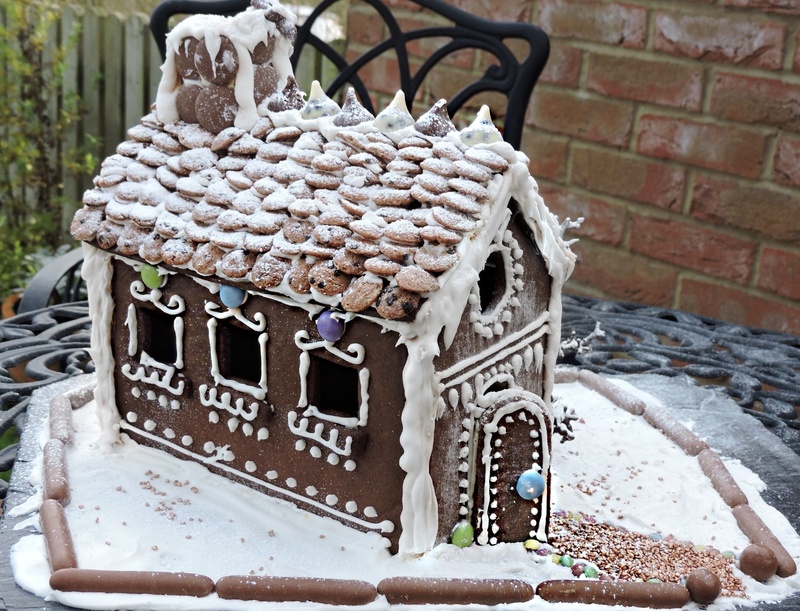 The gingerbread recipe is from this site. Speechless! Undoubtedly you were born to bake! 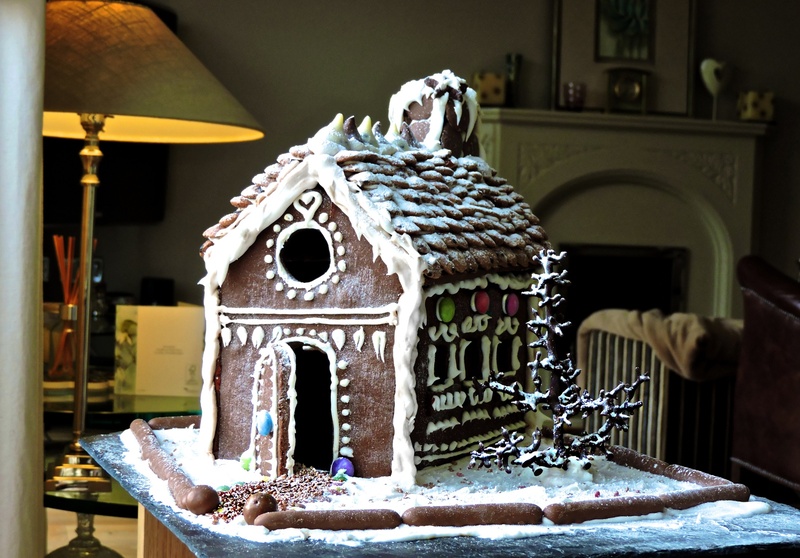 Not sure i can take on the challenge of putting up a whole house but like the twist on the gingerbread recipe; hate the usual recipe!